Instagram puts businesses in a predicament. The site is undeniably influential, but promoting a business effectively on Instagram is not easy. Your ability to post links is limited and it’s difficult to share content. Yes, you can throw a single link in your bio, and if you have enough followers on your business page, you can put a link into your stories, but those only live for 24 hours. You can also join conversations by utilizing hashtags, or by tagging other users. But that’s about it. Oh, and ads. Let’s face it: Instagram wants you to pay for ads. These issues make Instagram both fascinating and complex. Even if you have a large advertising budget, much of your success on the site will come down to how much time and effort you can dedicate to grinding out pictures and videos, and, at the same time, engaging with other users on the platform. Creating content can be difficult and costly. Access to writers, photographers, videographers, artists, and influencers comes at a premium. What if you could get Instagram users to create content for you? It’s possible to use a contest to create a level of engagement on Instagram that would be difficult to replicate unless you’re investing in ads. At the same time, you’ll be collecting tons of content your business can use down the road. First things first. To enter your contest, will people be directed to a landing page, your website, or will they post to Instagram? Landing pages are typically ideal for contests, as they are a dedicated lead-collection page, so people are less likely to get distracted by navigation menus or anything else competing for their attention. Landing pages are ideal for ad conversions. Sometimes though, it will make sense to run your campaign on your website, especially if one of your goals is to increase website traffic or e-commerce sales. Another option is to use hashtags and tagging in Instagram posts as the way people enter. Typically, you would tell people they can enter by posting a picture or video while including a branded hashtag and/or tagging your account in the post. This can be a great way of providing an easy mechanism for entry on Instagram, and also growing your influence in the platform. 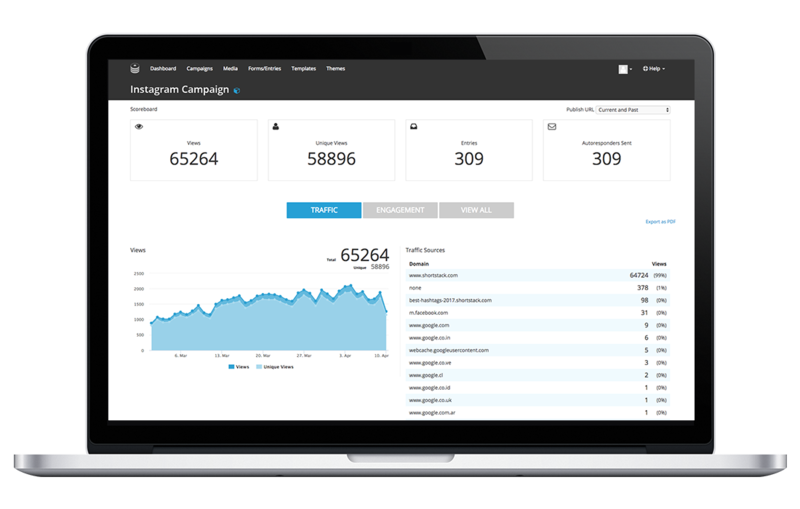 If you want to use hashtags and/or tagging with Instagram, but also want to effectively promote your campaign outside of Instagram, ShortStack allows you to get the best of both worlds. You’ll be able to create a campaign that can live on your website or as a landing page where people can submit their photo or video through a form, while also aggregating entries from Instagram (and Twitter too!). Typically, this solution will yield the most submissions. Now that you’ve settled on how people will enter, let’s look at the specific costs associated with an Instagram contest. We’ll start with the most significant cost. Not all contests will require custom development. You won’t always want to run a photo or video contest, sometimes you just want to collect contact information. But if you want to run unique and engaging contests, you’ll probably need some custom development. Additionally, if you want to promote your contest outside of Instagram, you’ll want have a place where all submissions are aggregated. Otherwise, you’re looking at a lot of manual labor pulling everything together, and an unfriendly user experience. An experienced web developer can charge upwards of $150 an hour, and the median salary for one is $78,057. If you have a unique project, prepare to pay at least a few thousand dollars to have it built. 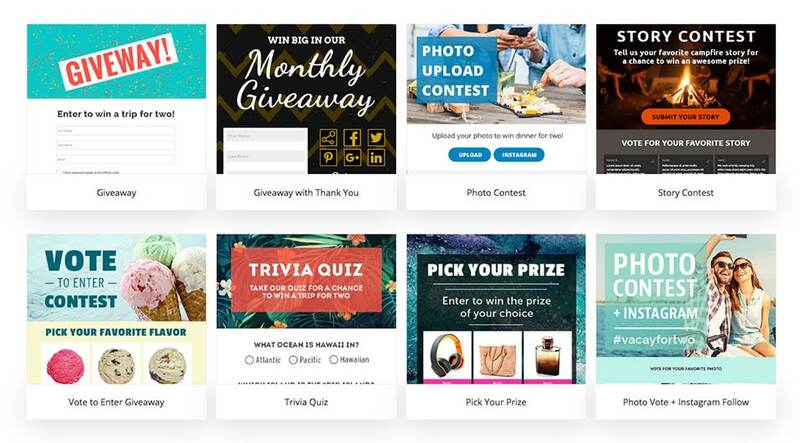 As with design, ShortStack has templates for unique contests, including photo and video contests, and widgets for functionality that would otherwise require custom development. Even on ShortStack’s free plan, you can run a form-submission campaign that can accept photo and video submissions; for an optimized campaign that will pull Instagram posts through tagging and branded hashtags, you’ll need to be on the Brand plan ($499/month). You’ll need someone fluent in HTML and CSS to design the aesthetic elements of your contest. They’ll typically need to be capable in Photoshop as well. A freelance web designer will charge somewhere between $40 and $100 an hour, and the median salary to employ one is $73,773. The amount of time needed to design a webpage will vary based on the complexity of your campaign, but you’re probably looking at a few hundred dollars at minimum. 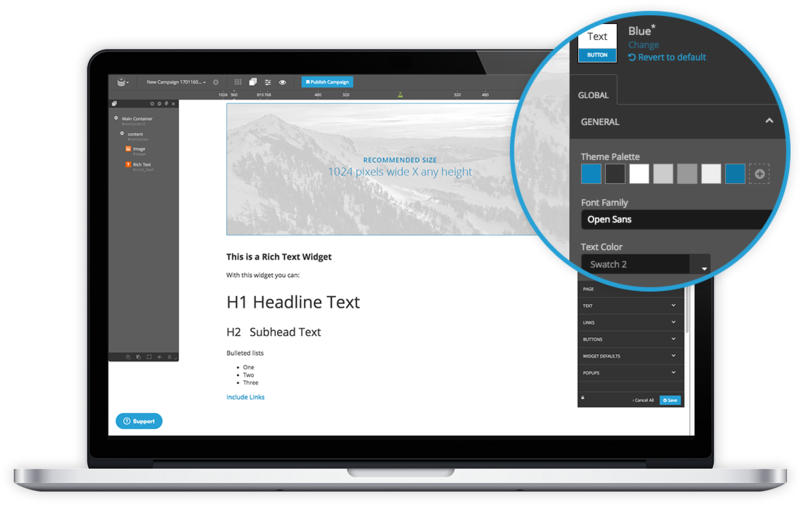 The ShortStack platform eliminates the need to hire a designer. You’ll have access to our Style Panel tool, to help you create the look you want without having to possess any technical knowledge of HTML or CSS. Plus, we have integrations with Canva and Pixabay to provide you with artistic assets, along with a media uploader for any logos or additional artwork you want to include in your contest. If you already have a website, this should be covered. If you don’t, or you need something specific for your contest, then you’ll have to register your domain through a third-party service. There are many services that offer domain registration, and the costs vary. If the domain you want isn’t taken, then the cost to register the domain can range from free to $15 a year. If the domain is taken, however, your cost will depend on the current owner’s asking price. We have domains ready to roll for your campaign, so there is no cost or hassle of finding a home for your campaign. You can also embed your ShortStack campaigns on your current websites and/or display them as popups. Hosting and domain registration typically go hand-in-hand. You can use popular services like GoDaddy or DreamHost to register your domain and host your website. The price range for hosting usually starts around $8 a month, but can exceed $100. There is no cost for hosting your campaign. You can use the Free Plan to create a landing page for your contest. It’s generally a good idea to budget for some ads for your contest. Organic reach can be powerful, but Instagram ads provide targeting tools to help you gain exposure where you might not otherwise. There are other considerations, such as the bid type/amount, the quality of your ad, and the industry you’re competing in. Regardless, you’re probably looking at a few hundred dollars, minimum. Unfortunately, we can’t make ads cheaper for you. However, our templates are professionally designed to convert form entries at a high rate, and ShortStack’s hashtag/tagging integrations will help you get as much organic traffic and participation as possible. Time isn’t always a bottom-line consideration, but it’s an important one. If you run a business, your time is being disbursed in many directions. If you have employees, time spent on one project takes away time from another project. If you’re the employee, the faster you can deliver on one project and move on to the other, the better you will look to your employer. 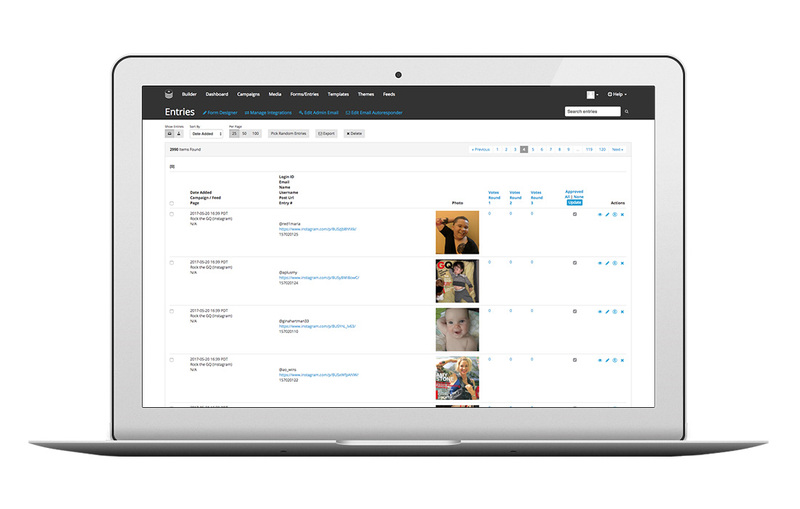 In addition to everything already mentioned, ShortStack provides users with a dashboard to stay organized, the option to replicate previous campaigns, the option to create your own templates and stylized themes, the ability to review analytic reports, moderate entries, and manage email marketing efforts, among other things. You can also rest assured that your data is being secured to the highest industry standards. Now let’s put those numbers into perspective. Let’s say you want to run a contest where Instagram users can post an image that tags your account and includes a branded hashtag. These posts are pulled into ShortStack, where you can view and manage which entries are approved before they are displayed in a gallery on your website. On your website, you also provide a form so the contest is not entirely reliant on Instagram. This allows you to promote the contest through other marketing channels (e.g. Facebook, Google ads, email campaigns, SEO). You could likely register a domain for $1, or you could build the contest into your website for free. Hosting could cost $8 per month, or you could host it on your own site for free. It would take a professional web designer between 10-15 hours to make a contest, which would range between $400 and $1,500. Development would be the bulk of your cost. To create the database for your entrants, implement security measures, and execute the workflow of the campaign, it would take a developer upwards of a month. If we take the salary figure for a developer ($78,057), that’s upwards of $6,505, not to mention the time being dedicated. Important caveat: To create a gallery that could aggregate entries from Instagram alone would take months of development, so we’re not going to go over what it would take to be granted access to Instagram’s API and develop an application that could operate this contest. You’ll need a software program. We believe ShortStack offers the most cost effective solution. That’s a minimum total of $6,905, before we even consider advertising costs (or another third-party software solution to gather Instagram posts). Of course, this is the cost estimate if you decide to build this campaign from scratch. With ShortStack, you would be able to build a contest optimized for Instagram for $499 a month, or for free, if you don’t need to collect entries posted to Instagram. But what about time? Where it would take a developer months to create a similar campaign from scratch, you could reasonably create this campaign in one to three days with ShortStack. You’ll also have a robust email marketing platform and the ability to create and run a wide variety of campaigns to achieve an array of objectives. Brent Danberg is ShortStack’s VP of Business Strategy. Over the years, he has advised more than 1000 businesses and agencies, helping them achieve their digital marketing goals. Read more articles by Brent Danberg.